Michelle Obama never mentioned President Donald Trump's name, but she was clearly warming to the subject. CHICAGO: Who might Michelle Obama have been thinking about when she said "words matter" and "you don't tweet every thought"? The audience gathered for the Obama Foundation's inaugural summit exploded in laughter and applause, but the former first lady demurred: "I'm not talking about anybody in particular," she said. She never mentioned President Donald Trump's name, but she was clearly warming to the subject. "You're the first lady or the president, the commander in chief, and you have that voice," she said. "You have that power - what comes with that is the responsibility to know that every word you utter has consequences." "At this level, you see how much words matter," said added. "You can't just slash and burn up folks because you think you are right." The former first lady was freer with her own words than she was during her eight years in the White House as she shared her reflections on everything from speaking out against sexual harassment to her parenting philosophies. She sat on stage for an hour for a relaxed and wandering conversation with her friend Elizabeth Alexander, a poet who has known the Obamas for more than 20 years. In response to a question about how she found her voice, Obama said her parents had always solicited her opinion and encouraged her to speak her mind. She quickly segued, however, from her childhood reminiscences to a topic that is very much in today's news. "When we think about women in particular, we ask them to speak up. We ask them to speak their mind. We ask them to just say no, to speak out against sexual harassment, to speak out against inequality," Obama said. "But if we don't teach our young girls to speak at an early age, that doesn't just happen. It takes practice to have a voice. You have to use it again and again and again before you can say, 'No' or 'Stop. Don't touch me.' "
The former first lady has maintained a light schedule since leaving the White House. Her time is spent working on her memoir, planning for the Obama foundation and library, and traveling for paid speaking gigs. She is said to relish the return to a private life, and focused her early months on getting her family settled in their new home and, then moving her elder daughter, Malia, to Cambridge, where she is a freshman at Harvard. 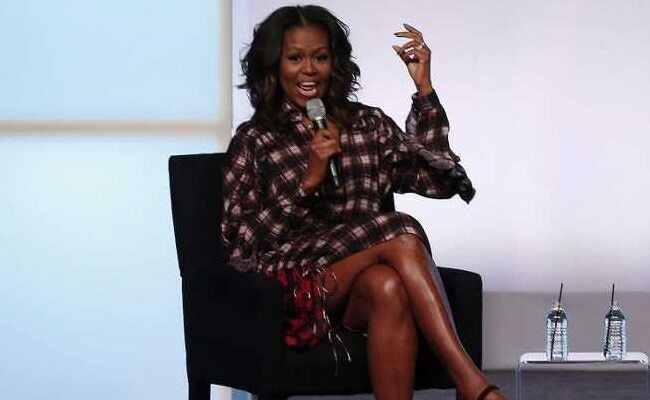 She has rarely weighed in on politics, though at one recent speaking engagement, talking with feminist author Roxane Gay at a business conference, Mrs. Obama said that "any woman who voted against Hillary Clinton voted against their own voice." She and Alexander, who read a poem at Barack Obama's first inauguration, didn't broach questions about electoral politics. Instead, Michelle Obama seemed deeply nostalgic. With her mother Marian Robinson in the audience, Obama turned nostalgic and reflected on the way her childhood on Chicago's South Side shaped her. Obama also talked about the importance she had placed on maintaining her "circle of girlfriends" during her White House years and raising their children. "I had to plan my time with my girlfriends that kept me grounded," she said. "Women, we do it better than men." To the male members of the audience, she added: "Y'all should get you some friends. Get you some friends and talk to each other." Historian Burton Kaufman, who recently paid $95 to see Michelle Obama in an onstage interview with David Letterman, said that her remarks had a practiced rhythm to them and that she is talking more about the topics she loves. "She went out of the way to make it clear that they want to stay away from politics. They don't want to be involved on a day-to-day level," said Kaufman, who is writing a biography of Barack Obama. "They are putting a lot of time into building future leaders." Questions about whether Michelle Obama will run for office continue to percolate through the political world. She did not address the topic Wednesday. "I would be the most surprised person on the planet," said David Axlerod, who was her husband's chief political strategist. "She was a conscript to politics. She wasn't someone who rushed to it or who loves it."